This recipe has quickly become my go-to fix. Tasty, light and guilt-free, this dish is so simple to prepare, cook and eat. Even if you have bad knife skills, or even bad knives, you can create a dish to be proud of. The beauty of this dish is that you can add any type of veggies that you have left over in your fridge. Chop off both ends of the courgette. Using a potato peeler, create thin slices from one end to other so that they resemble ribbons. Turn the courgette to a different edge once it gets too thick. Once sliced, pile a few ribbons of courgette on top of each other, and cut thin strips from one end to the other until your courgette resembles spaghetti. Place the courgetti in a small saucepan with a teaspoon of butter and leave it on the side to heat up later. Slice all the veggies into small chunks. Add the chopped veggies and Quorn to a heated frying pan with a splash of oil. Cook it for around 5-6 minutes, stirring occasionally to stop it sticking. Add the tinned tomatoes, a splash of water, plus salt, pepper and mixed herbs to taste. Let it simmer for a further 4-5 minutes. While your Quorn is simmering, place the courgetti saucepan over a low/medium heat and stir it to allow the butter to melt and coat the courgetti. The melted butter will heat up and soften the courgetti to perfection. Add a bit of salt and pepper and it’s ready. 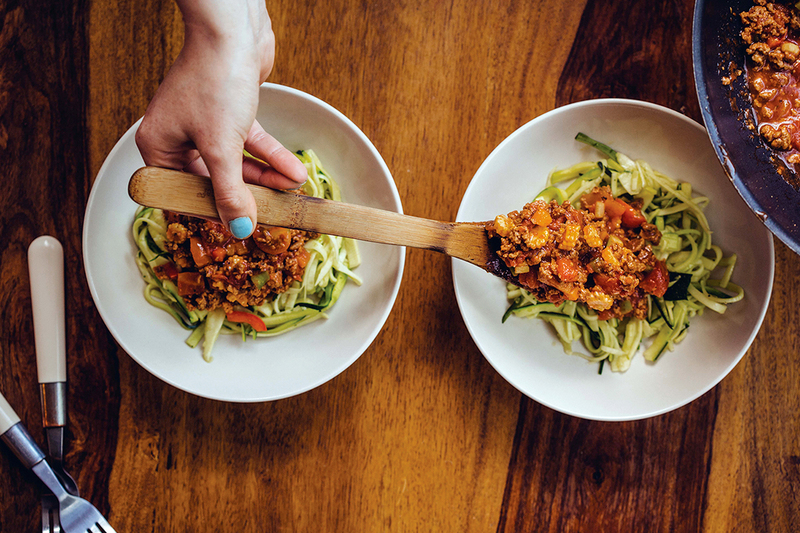 No need to drain – just add your courgetti to a bowl and top off with your bolognese sauce and enjoy. A guilt-free tasty meal on the table in less than 20 minutes. Create this healthy, guilt-free dish on a fabulous Leisure range cooker. Add colour to your kitchen with our amazing selection of colourful appliances, see our collection of cream range cookers, stainless steel range cookers and black range cookers.